Mr. Ferris and His Wheel – Another Fantastic Nonfiction Book | What is ML Reading? I wrote this post in October. Then, neglected to pretty it up and post it. 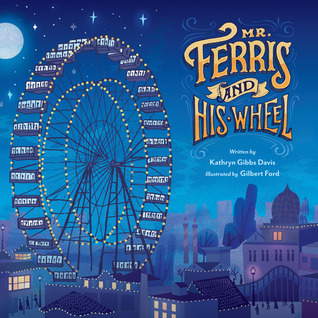 Mr Ferris and His Wheel by Kathryn Gibbs Davis and illustrated by Gilbert Ford is a another of ML’s favorite illustrated nonfiction books from 2014. The North Carolina State Fair wrapped up this past Sunday. So we won’t be hearing fireworks at 9:45 each night until October 16, 2015. I’m not ashamed to say I’ve never attended. I’m not against fairs; but my body is against being anywhere near a horse. And horses are at the fair. So ML enjoys the fair with her dad. Mr. Ferris and His Wheel by Kathryn Gibbs Davis and illustrated by Gilbert Ford arrived the week after ML attended the fair. Earlier in the week, she exclaimed, “I rode the ferris wheel at the fair.” So I knew it would be a hit. This beautifully illustrated, historical record of the 1893 Chicago World Fair wanting to outdo the Eiffel Paris from the 1889 World Fair is a highly readable amusement. The perfect pacing left us wondering if this engineering feat would be completed in time for the fair. If so, would it actually work? An official photograph of Geroge Washington Gale Ferris Jr is included at the back of the book. ML pointed to a picture frame on our bookshelf saying, “He looks like the guy over there.” It was a photograph of my great grandfather. She was correct. They both had somber faces, similar hairstyles and clothes. Neither was looking directly in the camera. This entry was posted in Nonfiction Book and tagged Gilbert Ford, Kathryn Gibbs Davis, Mr. Ferris and His Wheel by mlreads. Bookmark the permalink.